Happy Monday everyone! Hope you all had a good weekend. I spent mine enjoying the weather, cruising around in a bright blue Mustang convertible my boyfriend rented for his business trips, celebrating my friend's new restaurant opening, and watching the Super Bowl. This was what I wore out to cruise around on Saturday! I've been looking for a really cute fashion tee, and came across a lot of brand-inspired clothing (and phone cases) on It's Called Retail Therapy. Here are a few of my favorites: Coco Made Me Do It Tee, Celine Paris Tee, YSL Tee, Floral Lace Crochet Shirt, and Chanel Boy Phone Case. The shirt that I'm wearing will be available soon on the site. You can order it now via email-- itscalledretailtherapy@gmail.com. Use the code 'SAMANTHA10' for a 10% discount. Happy shopping! P.S. I apologize for the delay but I'll get to all of your comments tonight! Thanks for reading! Love the top you look fabulous. The skirt is perfect, love the leather look ! love everything about this outfit:)) i even have a similar skirt! Love that shirt and how you dressed it up! So cute! I like very much this skirt and this coat. I followed you on bloglovin, It would mean the world if you'd follow back. Fabulous top! And I love your necklace. Very girly and glamorous! Pretty outfit! I love your skirt :) Thank you for following me, follow you back already. That shirt is so cute and your necklace is a stunner. So wonderful to see your gorgeous legs in those tights again. Always an amazing sight :) Such a beautiful lady! hey samantha!ofcourse we can follow each other,i followed u via GFC,,,nw waiting for u to follow back,,,and i loved ur necklace and ur lipcolor. I love your skirt and the t-shirt is cool. yes of course!! follow us and we come back for sure!" Oh my freak! 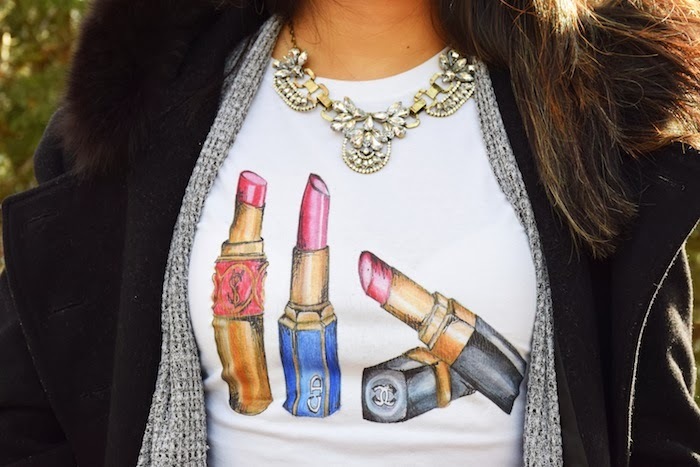 I love that litpstick shirt! I clicked on the link and everything else was just as fab! Love it! Gonna shop 'Its called retail therapy"! u look grgs..i love the top..v pretty.. I am Iván, owner of the online clothing store and blog "IvoryBrand store" (www.IvoryBrand.com). We are trying to find a person for to sell our clothes at stores in exchange for commission and we thought of you to propose our idea. It's a good opportunity to make money. It's simple, it's about what following: We sell wholesale to physical street stores. You just have to go to physical stores and to try to sell our products to the store. If finally they are interested and place an order, you will earn 10% of the order (Except products collection "Diamond Horn", you would earn 20%). However, if the owner buys products from the " Diamond Horn" collection, we can offer up to 20 % off. Honestly, we will be glad to have you. You know the fashion, it would be an honor to work together. If you are interested, please contact us Contact@IvoryBrand.com or through our store www.IvoryBrand.com. I have already follow you on GFC and instagram. You look so pretty! Love that top with the leather skirt. I am in love with ur tee ! thank you for lovely comment on my blog! of course we can follow each other :) I follow you! and you? You are too cute! Love the booties. Great look :) Love this skirt! you look amazing, I absolutely love the fur! Hey Beautiful! Thanks for your lovely comment on my blog! I love how you styled this chic tee in a more dressy look! That coat is so gorgeous and perfect for the cooler weather. If you want to avoid the dry skin that can come with this time of year, though, make sure you have high quality shaving equipment. We're Dorco, a manufacturer of high quality shaving systems, cartridges and disposable razors for men and women. Chances are you're paying way too much for razors. Ours cost up to 70% less than leading brands. You don't have to sacrifice quality to save so much, though. Our razors are crafted with the highest quality blades and lubricating strips containing moisturizing ingredients like aloe and vitamin E to soothe and hydrate even the most sensitive skin. Read what others think about our products and our prices at DorcoUSA.com. Thanks for hearing us out, and for sharing this beautiful look with us! Te ves sumamente elegante, las botas cortas me fascinaron! Gracias por la vista, besos. Love the coat. I am a jacket kind of person and have always been since high school. I love having fabulous jackets. what a cute top! so chic with the leather skirt! that is such an adorable tee! love your outfit! Thanks for the visit, you look fab! We can follow each other if you want. Let me know. You look so beautiful! I like your coat and leather skirt and the T-shirt is so lovely! i super love that tee!! great well put outfit youre style is impeccable!